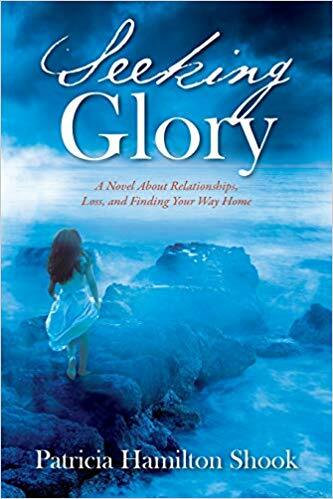 Seeking Glory: A Novel about Relationships, Loss, and Finding Your Way Home. FQ: I want to thank you for your time today Dr. Shook. I also want to commend you on your literary prowess and your attention to detail on one of my favorite places to have lived: Cape Cod. That said, I'm curious how this story began to percolate for you. SHOOK: The answer to this really blends in with the following question about my connection to the Cape. I've wanted to write a story that took place on the Cape since I was a child. As a matter of fact I tried to write my first Cape Cod based novel when I was probably about eight or nine. Unfortunately I was unable to finish it! I went with my family to the Cape every summer and I loved the place. It seemed the perfect setting for a novel and I had ready access to it for inspiration and ideas. FQ: Having read your bio, it's not clear if you lived on the Cape (or vacationed there often). Why the Cape for the backdrop of your story? SHOOK: My grandmother owned a cottage in Harwichport that she rented to her children and their families every summer for two weeks each. It was located with a multitude of other cottages that were a short walk to the beach in one direction and a short walk to downtown Harwichport in the other. It was perfect. So every year when I was a child my family and I spent the first two weeks in August in that cottage. I have many wonderful memories of the Cape and I looked forward to going there every year. I still go there every year for a week although I don't stay at the Harwichport cottage. Why not write a book that took place there?! FQ: I enjoyed the opening line of your synopsis: 'Life is never static...' Is there a moment in your life where you can attest to such a sentiment and what was the outcome? SHOOK: Yes although it's not something I can go into in any detail here. Suffice it to say I feel empathy for Kate's desire to shut herself off emotionally from the rest of the world. As she and I both discovered eventually something happens to force you to deal with what you were avoiding. It had a lot to do with my becoming a psychologist and obviously in creating Kate's character. FQ: You described so many wonderful places on the Cape in your book. Having spent a summer living there, it brought great memories back to mind for me. If possible can pinpoint one stand-out, 'must do' when one goes to Cape Cod? Why? SHOOK: Well, I think you must know what a difficult, almost impossible, question that is. Nevertheless, Provincetown the only answer I can come up with because it embodies so much of the Cape: beaches, sand dunes, the harbor, the wharf with its fishing and whale watching boats, the quaint cottages and houses, great places to eat. I could go on and on. FQ: As a child, I have vivid recollections of taking family road trips to New England. My mother had an intense fear of driving over bridges and her anxieties would certainly resonate with me and my siblings--particularly crossing the Tappan Zee Bridge. You mention both it and the Sagamore in Seeking Glory. Do you have memories of the first time crossing either bridge and what was your reaction? SHOOK: Thankfully I have no anxieties or phobias regarding crossing bridges (called gephyrophobia, they all have names). I've only been across the Tappan Zee Bridge a few times; it's a bridge with some nice vistas as I recall. Now, given that I was about nine months old the first time I crossed the Sagamore Bridge I can't say much about that. However, crossing the Sagamore Bridge did play a significant role when we went to the Cape later in my childhood. On the first Saturday in August as my family and I drove south down Route 6 I would be waiting and watching for the bridge to suddenly appear around some low hills. When it did appear it was very exciting because when we drove across the bridge and touched land on the other side we were well and truly on the Cape. You weren't on the Cape until you crossed one of the two identical bridges; the other is the Bourne Bridge. FQ: Without too much of a spoiler, Kate's ex-husband David is overly aggressive. His character is very credible, and I wonder, was he tailored after someone in real life? SHOOK: No, actually. David was a character who developed over the course of writing Seeking Gloryin response to what the story needed him to be. I did try to soften him up some and give him a gentler side which I hope came out when he was with Glory. I might add I have no experience with guns and no one else in my family used or owned guns to my knowledge. As the story went along and David's use of guns came more to the forefront it occurred to me that I had developed a theme in the story that played into some of the current issues about gun control and gun ownership. FQ: Again, I don't want to give away too much to the story, but I'm curious as to what, if any experience/exposure have you had to a cult? SHOOK: I have had only one close encounter with a cult. In 1976 I was attending San Francisco State University when I began hearing about this preacher named Jim Jones who had a following/church called the People's Temple. The general buzz was that he was a truly great Christian who was engaged in charitable works and had a congregation representing the ideal in racial harmony and understanding. I remember driving by the People's Temple located in an old building on Geary Blvd. that did not look much like a church and had a fleet of buses out back. I thought about going in but I didn't. Sometime later I attended a rally where Jim Jones was one of the speakers. You have to realize Jones was a well known, respected and influential preacher/political figure in 1976 San Francisco. I can still see him sitting there, a reasonably nice looking man wearing sunglasses. However when it was his turn to speak I quickly lost all interest because he sounded like any other preacher I'd ever heard; to me he was nothing special. I really paid no further attention to him until two years later when the mass murder/suicide occurred in the jungles of Guyana. It was probably a good thing I never went in the building on Geary Blvd. I doubt I would have lasted long anyway. FQ: I found this story to have a great ebb and flow to it. Was there ever a time when you felt the momentum dwindling (and what did you do to get back in your 'writing groove')? SHOOK: It took me several years to write Seeking Glory. Momentum certainly dwindled for long periods mostly because life kept getting in the way and there was no time for anything else. It's never static you know and just when you think you finally have everything under control that illusion is shattered. Hmmm I think that's from a book I read. Anyway, there was a great deal of ebb and flow to Seeking Glorybut I always came back to it eventually because I felt compelled to write it. I don't know why or how to explain it. The plot, the characters, and the placement had come to me easily but it needed many revisions, editing, and extensions. I didn't mind though; for the most part I enjoyed writing it. FQ: I enjoyed the nuances you wove into the story that addressed the spirituality of mind, body and soul. Do you practice yoga on a regular basis? SHOOK: I have never gone past a very basic level of hatha yoga. I have practiced meditation for some time however and find that very calming and restorative. As I have said I find religion/ spirituality fascinating and have spent many hours studying/learning/reading books covering a broad spectrum of spiritual beliefs and practices. FQ: As a psychologist, and given the foundational premise of your story, if you had to offer one piece of sound advice to mother and daughter on how to work though conflict during the challenging teen years, what would it be? SHOOK: Of course, there is no single piece of advice to be given because circumstances can be radically different from one family to the next. That said, let's take this from the perspective of Kate and her daughter Ally. In the wake of a contentious divorce, Kate's insecurities about her ability to be successful as a businesswoman and a mother led her to not trust herself and to be unable to trust Ally. As Ally grew older and more independent Kate became increasingly afraid and as a result increasingly demanding and controlling. It had the opposite effect to the one she wanted. I would certainly have advised Kate that she needed to be able to learn to trust and feel confident in herself as a mother as well as to trust Ally and give her some space. FQ: I want to thank you for your time and commend for delivering an enjoyable read. Are you working on your next novel? If so, are you able to provide a sneak preview? SHOOK: Yes I am working on another novel. As with Seeking Glory this is a book I have felt compelled to write. There is also a third book for which I have done some writing as well. This is not a trilogy by the way although there are some similar themes, religion/spirituality being one of them. The next book also involves family issues and an element of mystery.